As we planned our moved to Ecuador we bought a lot of books. Not just books to learn Spanish or books about becoming expats. Once we decided on Ecuador, we were hungry for information about what was actually there (here). Thinking about Ecuador retirement? Check out this list of the top books about retirement in Ecuador. We wanted to know not just about Cuenca, but also the other cities and towns in this new country of ours. We looked into the many travel and expat blogs, but found it hard to sort out the information we wanted. Many blogs are just stories of who-had-lunch-with-who. Others are primarily complaining about “how things are” living in Ecuador. Certainly personal blogs have a place – especially when you know the person writing – but it wasn’t what we needed. Both Dena and I are big on details. We wanted as much real info as we could find. And with multiple sources, we could kind of get a balanced view of what it was really like here. As we planned our trip, we spent a lot of time at Chapters – Canada’s version of Barnes and Noble. Armed with a Starbucks coffee, we spent hours (and hours) over many months reading and buying books. 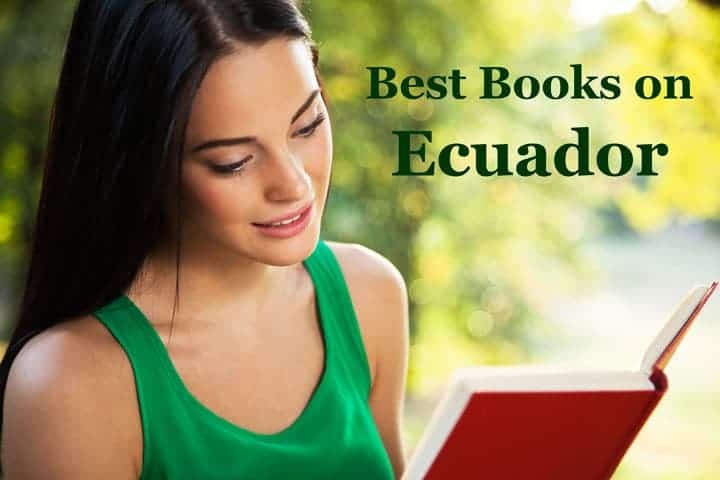 We easily read more than 20 books on Ecuador and becoming expats. We hope you’ll share your comments below! “The Rough Guide to Ecuador” is the essential travel guide with clear maps and coverage of Ecuador’s unforgettable attractions. Whether exploring the magnificence of Quito’s colonial centre, haggling in its highland markets of Zumbahua or navigating the rivers of the Amazon rainforest, the “Rough Guide” steers you to the best hotels, restaurants, stylish bars, cafes, nightlife and shopping in Ecuador across every price range. You’ll find detailed coverage on staying safe in Ecuador, practical advice on where to learn Spanish and how to climb Cotopaxi, as well as expert discussions for Ecuador’s history, culture and environmental issues. Curious about where to move? Here are 7 reasons that Ecuador is the best country for expats. We found that in each of the books there were specific facts and details that were unique to each of them. But the majority of details, hotels and travel tips were repeated almost exactly. This is my favorite of all the travel books we bought. At the back of the book there is a full travel tips section covering everything from getting to Ecuador, traveling around once you are here, how to handle finances, cruises in the Galapagos, and finding good restaurants, hotels, and attractions. This is the best book that we’ve seen covering specific features and things you need to know about Ecuador and the Galapagos Islands. This best selling book by Lonely Planet covers the best advise on what to see – and what to skip. Includes details about the Otavalo Market, Quito attractions, Galapagos travel and more. Read more about Ecuador travel. If you’re planning a trip to the Galapagos, you should pickup this book! It is packed with great photos – great for identifying the unique species that you will see. Covers 200+ common species and 400+ color photos, maps and drawings. Written by travel writer Shannon Enete, this title is her second in the “Becoming an Expat” series. She has also covered Thailand and Costa Rica. She covers topics such as immigration, healthcare, moving as a family, how to live rent free and more. One reader commented that she learned more by reading the book than visiting Ecuador. it is inexpensive, delivers fast, and covers a wide variety of topics. If you have read this book, please share your thoughts in the comments below. I would love to have your input on this book. With more than four years of living in Cotacachi, Larry Smith shares all the specifics of what it is really like to live in this Andean town. The books seems to focus on cost of living sharing everything from the cost of bananas, bus fare, and 3 course lunches to the range of rent prices ($100 to $450/month). Read an another expat profile from Cotacachi. Since I first published this post, I created another list of the top books about retiring in Ecuador. In this post, I include the top 17 books about retiring in Ecuador – written by expats in Ecuador. This top selling book on Ecuador culture comes well reviewed. This book comes highly recommended by Chris Hoyt of LanguaTravel. I know, maps are not that exciting. But what’s interesting is that good maps are not easy to find here in Ecuador. Especially English ones. While I felt like I was getting a little carried away, ordering maps before we made the move, I am happy that I did. Every city and region have small tourist maps but they are not good quality, and certainly don’t have very many street names on them. The maps that we purchased on Amazon.com while we were planning a move came in handy even before we left for Ecuador. We were able to get a mental picture of where Cuenca was located in relation to the major cities (and their international airports), how far we were from the coast, the jungle, and other points of interest near Cuenca. When we moved, we had maps of the three major regions that we could find maps for: of the whole country of Ecuador, of the city of Quito, and the Galapagos Islands. We still don’t have a quality map of Cuenca, although we’ve seen them here in the center of the city. After more than three years in Cuenca I don’t feel that a city map would be as useful for us as when we first arrived. It’s true that there are good maps online that can be accessed via mobile devices and computers, but sometimes it’s nice to have a paper map in hand and see the large view of the area that you are researching. 12) Map of the 12) Map of Ecuador: This map of Ecuador is an excellent rendering of Ecuador’s road network and physical features. Distances between communities are shown, as well as gas stations outside of major towns. National parks and points of interest are also shown. An inset map of Quito is also shown. 13) City of Quito, Ecuador: A road map of Ecuador on both sides : one side shows a map of North Ecuador (from Guayaquil to Colombia) and on the other side is a detailed street plan of downtown Quito. The legend is in English and in Spanish. 14) Waterproof Galapagos Islands Map: Show all the islands and major developments. Volcano and elevation data are helpful in exploration. Also, information on specific animals and where to find them are clearly displayed. (Update October 5, 2016) Since I first published this post, a number of my favorites have been discontinued. As a result, I’ve updated the above list with currently available titles. So these are the books, maps and products we purchased as we were planning our relocation to Ecuador. Is there one I’ve missed? Please include your recommended research product in the comments below. Thanks! I’m so thankful I found your website – thanks for all the helpful information. I’ve been living in Taiwan for 13 years, and I’m thinking about making a change to Cuenca. The book recommendations are excellent, and I’ll be checking them out for sure. Another VERY HELPFUL book is Culture Shock Ecuador by Nicolas Crowder, who live(d) (s) in Ecuador and is married to an Ecuadorian women from Guayaquil. Thank you so much for all of the good information that you post!!!! It is so time consuming to do all of this research. I got this e-mail awhile ago, but hadn’t had a chance to open it, but now that I am ready for this information; voilà, I opened up the link from your email and all I have to do is read what you have already researched and I can get materials and information from there! I will definitely buy from your link so that you can get commission, because you have saved me time and energy to get the things I want and need for a trip there and a possible move! Like my highschool basketball coach used to say to us girls, “You’re wasting my life, ladies!” Time isn’t always about money, but it is about life; in this case both! The precious time spent out of your life is worth money from my pocket to save precious time of my life researching! It IS great to have paper copies in-hand, so thank you very much and may God Bless your endeavor!!! Actually computers and ebooks have increased book sales with MORE people reading more year after year. Computers and ebooks may have put a dent in the paper publishing industry (including magazines and newspapers) but NOT in reading or ebooks..that has in fact INCREASED by a great deal. Of course less trees are used for “paper’ as well. I have had a Kindle (Fire) HD for a year now after using the free apps on Amazon for other devices for 2 years. I buy way more ebooks than I ever did hard cover. I was always a big library user..now I buy. We are considering retiring to Ecuador, possibly Cuenca. I found your list of books interesting and will check them out. We are coming to Ecuador in February from Canada. I have many questions would you have any time to answer some of them? We downloaded 101 Questions Answered to our laptop last weekend and read the whole thing! Very informative and well written. We also love her blog site – yours as well! Picked up the “Insight Guide” a few weeks ago – also a great resource for the entire country of Ecuador. Our journey begins in February when we visit Cuenca for 9 days. We plan to move in August 2014.Can’t wait!!!! You can download the kindle app onto an iPad read kindle books without buying a kindle. We are coming as volunteers this summer to Cuenca. 101 Answers is Outstanding. You can get a Kindle app for virtually every conceivable computer, tablet and phone now. thanks bryan for the good info. im like a sponge soaking it all in. Hey Bryan, after reading this list, decided to first try #6, the “101 questions”. It’s an awesome book, tremendous amount of useful, factual information. Well written and from a knowledgeable perspective. I’d give it top marks and suggest it may be the best place to start researching a move to Ecuador. And it’s very inexpensive, as you say. Only catch is it’s available on the Kindle. The author sounds like an advocate, but you can still read the book on your browser “in the Cloud”. Personally… after researching them, I’m buying a kindle very soon. Thanks so much for your feedback – we love it! Like you, I am a research junkie! After all that reading, what main things in reality differed from what you had read? We are now happily living in Bahia! Your daughter’s blog helped my 9 year old daughter. Tate brought her doll (not the Canadian one) with her and she goes everywhere with us! Hi Kim – that’s a good question. I’ll give that some thought and write about it. Thanks for the reminders of the books. I do believe that people should read more. however we all know that computer has taken a big cut from book sales. I use to love to read, I have read many of Zane gray books, And enjoyed every one of them. However they were based on true life stories,yet fictional.